PICTON, ON – Barley Days Brewery has announced the release of a new beer created in collaboration with a Toronto establishment that is well known for its top notch selection of oysters and craft beer. Crafted by brewer Alex Nichols using the finest ingredients, this full-bodied dark beer has notes of chocolate and coffee, a velvety texture and finishes with subtle oyster undertones. One thousand whole Green Gables Malpeque Oysters from New London Bay, Prince Edward Island were added to the brew (shells and all! ), creating a unique and flavourful stout. With 4% ABV and an IBU of 25, this is an eminently drinkable stout and will be an ideal drink of choice as fall and winter approach. 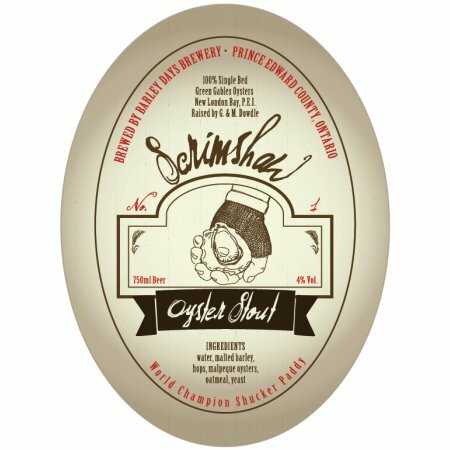 Scrimshaw Oyster Stout was launched earlier this month at Céilí Cottage, and will be available at select bars and restaurants in southern Ontario while supplies last. It is also available in 750 ml champagne-style corked bottles at the Barley Days retail shop in Picton.